NextEra Energy is betting big on wind and Florida – and the future is less than certain for both. NextEra Energy Inc (NYSE:NEE) is on the cutting edge of renewable energy. But edges can be dulled, and this forward-thinking utility isn't invincible. Here are three reasons why NextEra Energy Inc stock could fall. Source: NextEra Energy Inc . In investing and in energy, diversity is almost always a good thing. For better or worse, NextEra has ignored conventional thinking and built itself a slanted energy portfolio unlike any other. With more than 100 wind farms across the U.S. and Canada totaling over 10,200 MW of wind power, NextEra is the undisputed leader in wind technology. Wind power accounted for a whopping 56% of the company's generation in 2013. For almost every other American utility out there, wind and solar capacity combined barely account for a few percentage points. The primary reason NextEra can afford such an expensive alternative energy is supportive government policy. From statewide renewable energy goals to federal production tax credits, it's Uncle Sam that has whipped America's wind energy sector into shape. While no one expects lucrative production tax credits to extend indefinitely, the Environmental Protection Agency's (EPA) proposed Clean Power Plan could be the next big win for wind. The Plan would push the coal industry further into the mire, while giving states and regions all the financial and political thumbs ups they need to keep expanding wind energy assets. But there are major issues with the plan, and not everyone's elated with its enactment. NextEra Energy Inc has made its bet on wind, and shaky policy like the Clean Power Plan will, for better or worse, have a disproportionately large effect on this company's future. While NextEra is big on wind, it also has its fingers in the natural gas honey pot. It makes sense. Natural gas is a natural hedge to wind energy: when winds die down, natural gas "peak power" picks up to take over. And while gas currently accounts for 22% of NextEra's total capacity, inexpensive gas is not what NextEra wants. Wind energy doesn't need to be cheap – it just needs to be cheaper than the alternative. And with natural gas prices headed down again, wind's cost competitiveness is quickly disappearing. Natural gas has been killing off once-lucrative nuclear and coal projects for the past few years, and wind could be next. NextEra Energy has been smart to hedge its wind assets with natural gas investments. It has even teamed up with Sempra Energy (NYSE:SE) to construct Florida's third major natural gas pipeline. But 22% natural gas won't cover more than 100 overly expensive wind farms no one wants to buy from. 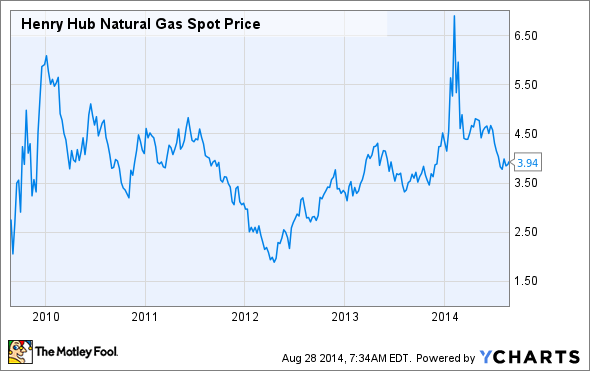 For NextEra to continue to succeed, it needs natural gas prices to keep heading higher. Fuel sources are only one part of this utility's equation. As full owner of Florida Power & Light (FPL), the state's largest electric utility and one of the largest in the country, NextEra also relies on regulated sales for a majority portion of its earnings. In fiscal 2013, FPL contributed an adjusted $3.16 earnings per share, compared to just $1.83 for its generation business. With regulated rates of return on equity, Florida Power & Light can be a consistently profitable powerhorse. But the American economy is still fragile, and NextEra's outsized reliance on Florida Power & Light could turn troublesome if the sunshine state's economy stumbles. But there are certain demographics NextEra can't avoid. Florida's economy relies more on retired persons and tourism than most other states – and both are under economic attack. The future of social safety nets that would allow baby boomers and beyond to live their best years in Florida are under question. At the same time, big vacations like Disney World or a beach house rental could be the first expenditure to get the axe if the America economy takes another turn for the worse. Retail sales fell a seasonally and weather-adjused 0.3% for FPL in Q2. A 1% bump in customer growth wasn't enough to outweigh a 1.3% drop in retail customer electricity use. If FPL sales shrink, NextEra Energy will lose one of its largest and most consistent moneymakers. There are plenty of reasons to think this forward-thinking, progressive utility will continue to keep its stock soaring. But investors would be wise to take their blinders off and realize that NextEra Energy is simply not the safest dividend stock out there. If you can swallow the risk and believe in reward, it could be the next stock for your portfolio. But if not, you might consider NextEra nothing more than a next best option.